Sometimes the sea was quiet and the sun was in the sky all the time, or so I thought. I was tempted to run to the shore and get a swim, but I suspected a storm would break the minute I’d touch the water. That was my imagination of course. I could hear the wind roar and howl and the waves hurled masses of cold rage against the other side of the page. I wrote a short story on the page, but on its other side the ocean growled. The paper was the wall that separated me from the endless freezing water. At times, I asked myself what would happen if I bored a hole in the page, I had even bought a penknife which I kept on my desk. I often forgot what I was writing as I sat there lost, motionless, listening. “What are you doing?” Len, my husband, asked, and I thought I saw fright in his eyes. I didn’t tell him about the crags, the surf, the waves hitting against the rocks. I didn’t tell him I heard screams of dying birds but he sensed something had gone wrong with me. When I was with him I couldn’t hear the ocean. I was afraid I would miss the rare sunny hours when the waves slept and barely touched the paper on the other side. Those were the prettiest days in my life. I glued my ear to the paper and listened. At first it was only the sigh of rippling water, then sands whispered and the shore was so near I could feel its pebbles on the tips of my fingers. We had a small house on the shore of the Black Sea. It was Len who bought it. I had never liked the sea. It raged and thundered in winter, in summer tourists infested the shore and the beach was full of them. I turned my back to the waves. Sometimes I swam at night when the beach was a sigh in the air. Then the surf and the night blended and the shore touched the page with the ocean I had left on my desk. “Maybe I am in love with another woman,” Len, my husband, said. What a funny man he is, I thought. You are free to be in love with anyone you want. You are free but I am not, Len. I want to go behind the page. But I heard slight barely audible tapping on the other side of the page. At first I thought it was a pebble that had hit the paper. Then fear seized me. I thought the sharp edges would cut a hole and my page would be torn into peaces. I panicked: what if the water burst into the house. My son was in his room. My son! The tapping sound on my page got stronger. I could swear somebody was typing on the other side. The surf was writing a short story for its shore. The noise stopped abruptly and then the sunniest day behind the page began. I could swear there were seagulls flitting over the surface of the water, the sun shone, and infinity loved me. I reached for the penknife that lay on my desk. I wanted to get there, behind the page. “I have to go,” Len, my husband, said. “Go,” I told him. “You are a free man”. They’d been gone for a month, my son and my husband, or so I thought. I had not written any stories. I described the sounds the water was making. They were magnificent and powerful. The page was the only barrier that cut me off from my dreams. Maybe Len and my son were at home all the time. Yes, somebody cooked food for me, and I didn’t care what had happened to the woman Len was in love with. The tapping sounds on the other side of the paper continued. The ocean was friendly and I thought of the writer on the other side of the page. He was not as tall and handsome as my husband. I believed his face was brown with the sun, and he was tired because he had been writing on the water months on end, and there was no one to read his fairy tales. I felt sorry for him and I tapped the page with a sharp pencil. He answered me. He tapped the paper so carefully, so timidly I could have cried. He didn’t know these were the loveliest hours redolent of salty water, soothing with the shrieks of seagulls. Was the ocean a string of days I had missed, days that had gone leaving no memory, no trace? Who had settled on the other side of the paper? I lived with my stories in the smallest room, in the unreality of water, on the shore of an angry black sea. I had a husband who was in love with another woman and a son who needed my attention all the time. They were not a part of my happy days. Maybe the shore on the other side of the page was the place where death waited for me, tapping ever so gently on the thin white sheet, letting me know it was much more real than my uneventful life, and the short story I’d printed on the paper was a door to oceans I had never seen. Was it my hope to go there that made a difference? The man, the one who was not very tall and handsome, lived in the story. He had a long purple scar on his cheek. I like your blue T-shirt, he had said to me. I’ll come and find you no matter what. And I’ll bring you a blue tulip. There are no blue tulips, the woman who lived in my short story had said. I was that woman. I lived in the words and the paper pulled me out of the stormy waters. I’ll bring you a blue tulip, the man repeated and the story ended abruptly. Maybe the biting winds behind the page were my panic I’d never see the tulip. My hopes surged, gleamed then were gone, and I knew they would not come back. My husband’s shadow was my home, my room was made of fears, and the waves behind the page hated the night. I froze in my tracks. I had no notebook and no ocean. No soothing smell of salt and infinity. I looked at my desk horrified. In the evening, I cooked potato soup for them. In the morning, I took my son to the zoo. I hadn’t taken him anywhere for months. We ate ice-cream and sandwiches, he told me tales. I listened, I listened hard. The waves were gone. There was no ocean and no seagulls. My son babbled on. My husband brought me flowers and suggested the three of us go to France, to the castles on the Loire, and the French Riviera. I wanted to stay home. I bought a new notebook, and then another one. None of their pages separated me from an ocean of fears and hopes, from squalls and tales of screaming waves. I locked myself in the room and listened. I glued blank pages on the wall and nothing happened. Death and fears had left me, hopes had left me too. My husband brought me flowers almost every day; my son was happy and cheerful. We invited friends and threw parties. You are beautiful, Anna. You are more beautiful than before. I am so happy you are back, my husband said. He didn’t know I kept a sheet of crumpled paper glued to my skin. I prayed to bring the ocean back to me. But the salty wind was gone. I took a job in the local library. I cooked delicious meals for my family, I took long walks with friends, and I wrote short stories and fairy tales. “We can go to see the castles on the Loire, what do you think?” My husband said. I thought I wanted to go. Rarely, at night I heard the waves beat against sharp stones. I heard screams of seagulls, I saw the page again and I wrote on it. 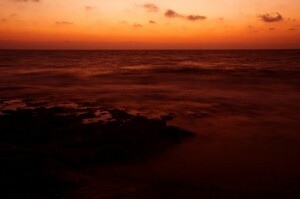 The endless water glowed, I wanted to swim to the shore, and I sensed the wind slept in the waves. Very rarely, I heard the tapping sounds and deep in my memories the short story gleamed, pale and silvery, like a shadow of a kite, like a song I had forgotten long ago but it was in the air I breathed. I was a happy woman again. I had my job and my family. The ocean had vanished and the wind had died. I was free. On the day before we started for the ancient castles on the Loire, my son and my husband went to buy a new suitcase. I was in the kitchen cooking lunch when the front door bell rang. “Coming,” I called out thinking it was my husband with the new suitcase. Out of breath, I ran to see it. A man, not very tall, not very handsome, stood in the door. A long scarlet scar ran down his cheek. I looked at it. I looked at it and could not breathe. “This is for you,” the man said. He gave me a flower, a tulip. It was blue. Impossibly blue. Zdravka Evtimova was born in Bulgaria, where she lives and works as literary translator from English, French and German. The following of her short story collections were published in English: “Bitter Sky”, SKREV Press, UK, 2003, “Somebody Else” MAG Press, USA, 2005, “Miss Daniella”, SKREV Press, UK 2007, “Pale and Other Postmodern Bulgarian Stories”, Vox Humana, Canada/Israel, 2010. Her novel “God of Traitors” was published by Book for a Buck Publishers, USA 2007.